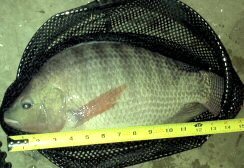 tilapia fish, fish farm, aquaponic farm raised healthy fish, tilapia fillets. WATCH LIVE VIDEO: FINGERLINGS - GROW OUT - BREEDERS - BREEDERS TRANSFERING EGGS & PICTURE SERIES OF BREEDERS EATING CLOSE UPS. 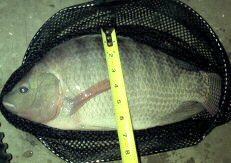 BREED INFORMATION: Tilapia is a large genus in the cichlid family (cichildae). There are several breeds of Tilapia fish listed below are a few of the more popular breeds below. 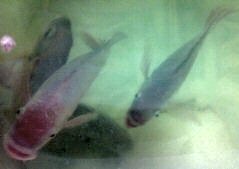 #3: Red Tilapia fish (reddish to pink sometimes with dark spots or marks) a manmade hybrid mating a version of Mozambique Tilapia scientific name of Oreochromis Mossambicus with Nile Tilapia or Blue Tilapia. #4: Blue Nile Tilapia fish look similar to Nile Tilapia fish but blue in appearance instead of black with the scientific name Oreochromis aureus & are more cold water tolerant. #5: Wami Tilapia fish has a scientific name of Oreochromis Urolepis Hornorum & is better in brackish water environments & salt tolerant. 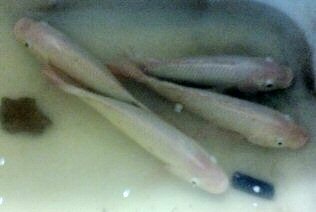 TILAPIA FISH HEALTHY & NUTRTIONAL DETAILS: TILAPIA is CONSIDERED BRAIN FOOD, HIGH IN PROTEIN, WITH LITTLE FAT, BONUS OF VALUABLE OMEGA-3 & 6 FATTY ACIDS. Aquaponic farm raised Tilapia are awesome for every age, especially elderly, growing kids & pregnant women. B12 is an important vitamin for cognitive functioning & helps red blood cells form properly. A typical serving of Tilapia (4 ozs) has 2.4 g of B12 this is the amount a body needs to function properly. Tilapia is awesome for bones with what some call the “Dynamic Duo” which is CALCIUM & PHOSPHORUS. CALCIUM helps your bones stay healthy & strong while PHOSPHORUS helps both bones & nails from becoming brittle. NUTRITIONAL DATA: (Nutritional values depending on size, serving & way prepared varies.) TILAPIA FISH NUTRIONAL DATA IS BASED ON A 4oz (113g) SERVING SIZE. CALORIES = 100, CALORIES FROM FAT = 15, TOTAL FAT = 1.5g, SATURATED FAT = 0.5g, TRANS-FAT =0g, TOTAL CARBOHYDRATES: 0g, PROTEIN: 21 g, SUGARS: 0g, DIETARY FIBER: Og, CHOLESTEROL: 50mg, SODIUM: 45mg. 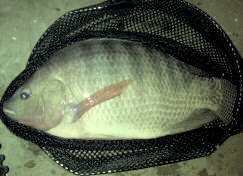 tilapia fish, fish farm, aquaponic farm raised healthy tilapia fish, tilapia fillets.